08/10 – Newtype #09 – Drop. 15-B (on sale). 09/10 – Newtype #10 – Drop. 16. 10/10 – Newtype #11 – Drop. 17. 08/12 – Shonen Magazine #37 – Chapter 227 (on sale). 08/26 – Shonen Magazine #39 – Chapter 228. 09/02 – Shonen Magazine #40 – Chapter 229. 08/17 – Young Magazine #38 – No XXXHOLiC scheduled (on sale). 08/24 – Young Magazine #39 – No XXXHOLiC scheduled. (CLAMP changed that. Chapter 186 was supposed to come out in this issue). 08/31 – Young Magazine #40 – No XXXHOLiC scheduled. 09/06 – Young Magazine #41 – Chapter 186. A CLAMP 2010 calendar will be released on October 15. The calendar will be called “CLAMP Calendar” and will feature the 12 illustrations that were first published as the covers of CLAMP No Kiseki (released during 2004~2005). The calendar is an original product of Pyrotechnist and manufactured by Movic (CLAMP in 3-D LAND). The calendar’s size will be 147mm×210mm and it will cost 1,575 yens. Thank you very much for scheduled. tsubasa keeping a steady flow…. i don’t know if i should be sad and afraid the end is getting more and more near or not…. 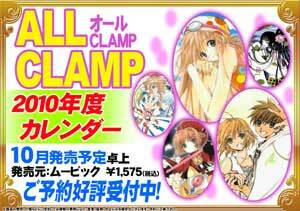 So there’s the Kobato calender, and now CLAMP edition. Not bad at all. Oh snap, I want that calendar. Looks like I get a break from the translations this week…which means I should do something else productive. Too bad about xxxHolic having another dry stretch. For all the Young Magazine issues dated 2009, xxxHolic has only run 17 times so far, and been absent for 20 issues. If you had a yearly subsrciption to Young Magazine, it would seem to be cheaper to just buy single issues. Truthfully, I’ve grown tired of Tsubasa these past few volumes and would rather see what happens in Holic. Interesting about the ALL CLAMP calendar. I’m surprised it’s a desktop calendar this year, and it seems to be much bigger than other desktop calendars from Japan (although they say it can be hung on the wall). Also, it’s ring-bound (instead of single sheets), but I guess it’s just nice that CLAMP’s calendars are back again. If you had a yearly subsrciption to Young Magazine, it would seem to be cheaper to just buy single issues. I want more Holic!!! Clamp, move on, please! I think I need this calendar. NOW. They really aren’t all that beautiful. The drawing looks simple to me. btw, any news bout the new Kobato chapter? kay then. 🙂 thanks for the hard work! I think volume 16 and volume 28 are definitely coming out this year. I would say October for volume 28 and November for volume 16. Thank you very much for the news! I wonder where I can get the calendar,it’s look very great! Gosh, other breaks for xxxholic? Yay for calender though. Do you mind that i added you for future updates? They changed release for xxxHOLiC again? No wonder there’s no chapter for this week. Nice news about the calendar next year! Thanks. The question is: Why so many breaks???? Why now??? I found the full size of the Code Geass pic!